6.4 earthquake hits northeast Alaska. It was the strongest quake ever recorded in the region. A magnitude 6.4 earthquake rattled a remote region of Alaska's North Slope southeast of Prudhoe Bay Sunday morning. The state seismologist called it the biggest quake ever recorded in the region. No damage was reported, nor were there any apparent impacts to the oil-production facilities and pipeline networks to the northwest, according to officials and employees working in the area. It's an unusual location for an earthquake in Alaska of that size. 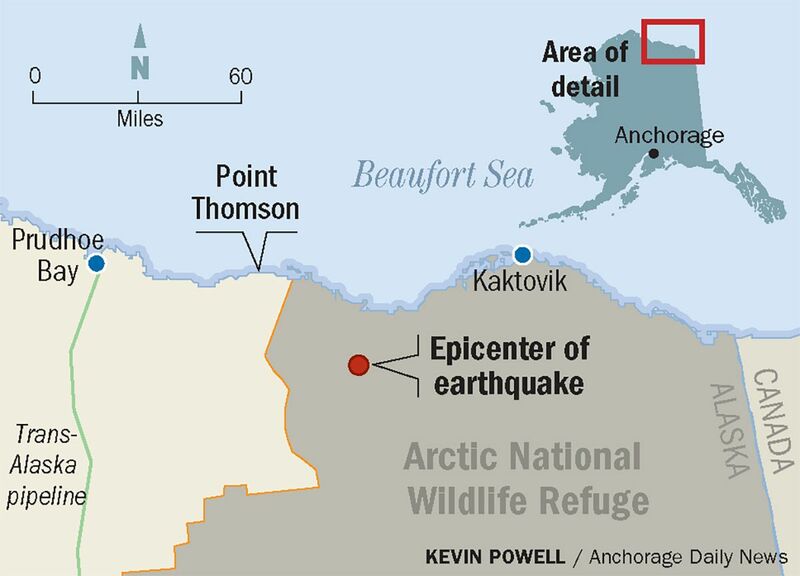 The quake was centered in the Arctic National Wildlife Refuge, about 52 miles southwest of Kaktovik on the Beaufort Sea coast, 85 miles southeast of Deadhorse and Prudhoe Bay, and about 100 miles north of Arctic Village, according to the Alaska Earthquake Center. The earthquake was widely felt in Kaktovik and by people who work in North Slope oil facilities. Mike West, the state seismologist, called it the North Slope's biggest earthquake ever recorded, by a sizable amount. "This is a very significant event that will take us some time to understand," he said. Unusually large North Slope earthquake at 6:58am, near the Beaufort Sea coast. Right now we have the magnitude at 6.4. Location is very remote, so there are no known or expected human impacts. We'll share info as we put it together. It hit at 6:58 a.m. and occurred at a depth of about 6 miles, the center said. 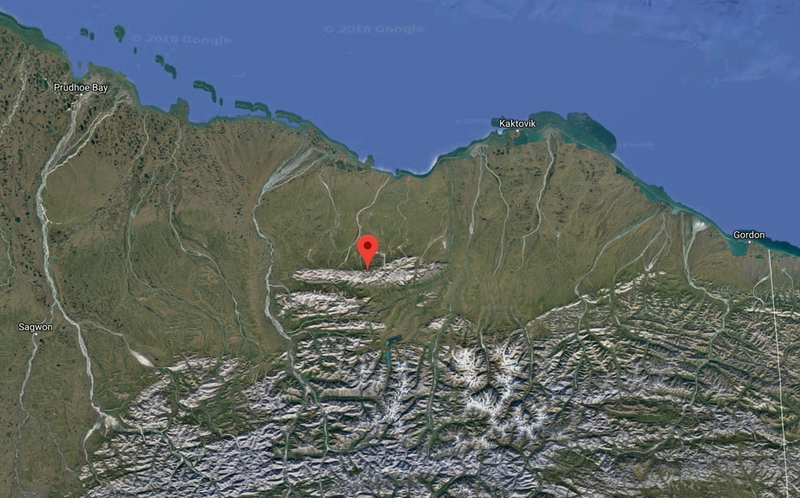 It spawned a "vigorous aftershock sequence" that included a nearby 6.0 earthquake at 1:15 p.m. – the second-largest earthquake ever recorded on the North Slope, behind the new record, according to a statement from the earthquake center. The epicenter of Sunday morning's quake was just north of the Sadlerochit Mountains, according to the earthquake center. Kaktovik, on the Beaufort Sea coast, is the nearest community. Resident George Kaleak Sr., 53, said his family was just waking up when they felt the earthquake. "All of a sudden our whole house started shaking, our beds, everything," he said. "It was pretty bad. I felt small earthquakes but this was the biggest I ever felt." The initial shaking lasted more than 10 seconds, followed by aftershocks. One resident in the village of 250 reported glass items falling and breaking in the house, but there were no reports of injuries or damage, said Kaleak, deputy adviser to the mayor. "It was some experience," he said. Alyeska Pipeline said there was no impact to the trans-Alaska pipeline, and that "there are no operational concerns" related to the quake, though there will be inspections of the pipeline. There was no impact to TAPS operations and there are no operational concerns following this morning's 6.1 earthquake near the North Slope. Per Alyeska protocol, there will be inspections of the pipeline and facilities along the northern segment of TAPS. There are no known impacts to BP facilities on the North Slope, according to an email from Megan Baldino, a BP Alaska spokeswoman. The company operates the more than 40-year-old Prudhoe Bay oil field and smaller North Slope fields. "At this time there are no reported impacts to BP facilities on the North Slope. Our teams did walk-throughs this morning and for now everything appears to be fine," Baldino said in an email. ExxonMobil, operator of Point Thomson, the closest oil field to the epicenter, said no damage was reported. "All staff are accounted for, and the Point Thomson team has completed an initial site assessment with no damage or impact reported," wrote ExxonMobil spokesman John Moore. Workers in Deadhorse, the industrial center serving North Slope oil fields, said they hadn't heard of any damage or injuries. Bob Rieth, a station manager at Northern Air Maintenance Services, said he was in a second-floor room on the phone for work when the building he was in started rocking. He thought the shaking had to do with a state construction project next door, but looked out his window and saw the workers standing around, looking at each other. "It was like, 'Oh, this is actually an earthquake," said Rieth. "The building's steel beams made noise as they were flexing, which is a bit disconcerting as I'm standing there getting ready to brush my teeth." Rieth said he's only felt one other earthquake on the Slope in 14 years of working there. "That was a little shaker that hardly got anyone's attention," he said. Dawn Foster, a technician for AT&T who has worked on the Slope for six years, said she was in the bathroom in her room at the Aurora Hotel in Deadhorse when the building started moving. "I'm like, 'Wait, I'm in an earthquake,' " Foster said. "I felt vulnerable. My next reaction was, 'I better hurry up and get out of here.' "
The rolling lasted about 30 seconds, said Foster. It was the first earthquake she's felt on the Slope. "Nothing fell over, nothing fell down, so it was not extreme," she said. "It was more a rocking than a jolt." As Foster spoke with a reporter by phone several hours after the earthquake, she said she felt another aftershock. "Wow, I feel a little movement on the back deck at work, and this building never moves," she said. Location of Sunday’s earthquake in northeast Alaska. The previous strongest quake in the area was in 1995 at magnitude 5.2. Another in 2010 was at 5.1 magnitude, West said. The jump from a 5.2 to Sunday's 6.4 is a significant difference because earthquakes rapidly grow in strength as magnitude rises, West said. "That's why at 6.4 this changes how we think about the region," West said. "It's a little early to say how, but it's safe to say this earthquake will cause a re-evaluation of the seismic potential of that area." Quick update on the human impacts. We have no reports of damage or injuries. Alyeska reports no impacts to the pipeline. We have felt reports from Kaktovik, Deadhorse, Nuiqsut and even a few from Fairbanks, so this was felt across a very wide area. The work to analyze the temblor has already begun, said West, reached at the geological center Sunday morning. "We'll understand a whole lot more about this earthquake as the days unfold, (exactly) how deep it was, the fault on which it occurred, its orientation, how long a rupture it was," he said. Mechanism for today's M6.4 earthquake was strike-slip, as we would expect in that region. It falls within a broad north-south zone of activity about 240mi long and 120mi wide from the Beaufort Sea down to the Tintina Fault. It is the largest quake ever recorded in that area. Earthquake monitoring has been pretty "spotty" in the region until a couple years ago, when the National Science Foundation began a seismicity-related project in the area. West said. But this isn't a case of better detection leading to a new record. West said even the older earthquakes above magnitude 5 would have been detected by instruments elsewhere around the world. West said the earthquake followed tectonic patterns of the previous, smaller earthquakes that have historically occurred in the area, indicating it's not related to human-induced factors, such as permafrost thawing from climate change or oil field activity. "There's every reason to think this is a perfectly natural earthquake," he said.